When Sadio Mané reacted fastest to the rebound, breaking Everton hearts on Monday night, he unleashed the most primal act in all of us. If you weren’t at Goodison, then, like me, you were up off the couch, fists clenched with the most guttural of roars leaving your throat. Relief, coupled with mild disbelief, takes over. You watch the players celebrate, dreading the linesman’s flag, then you hear Mike Dean’s whistle during the revelry! What?! No?! Is it disallowed?! But yessss, yes Sadio and Bobby get back to celebrating! Lovren appears through the smoke like it’s his birthday next Sunday. All is well. Mike Dean, blowing his whistle, was trying to keep celebrations to a minimum, in the midst of the flares and madness in the Red corner of Goodison. Mané’s 94th minute winner was huge. It won the derby at Christmas, it won the derby at Goodison, and hopefully, it has kept the Reds fighting in this title race. Football can do that, though. We get sucked in. The celebrations would have been similar if Liverpool were challenging Everton for 9th. If you doubt me just think back to the injury-time victory at Norwich last season. Klopp’s men were just trying to cling on to the slim possibility of challenging for the top four. Lallana smacked it home with almost the last kick of the game. Judging by the celebrations it was like the Reds had won the league. I’m not having a dig. I was the same. Up off the couch, fists clenched…. you know the rest. Football can do that, though. I’ve picked my top five late winners for Liverpool FC, since the turn of the century. Less than three months after Rafa’s men were defeated by AC Milan, and Inzaghi, in Athens, dawn broke on a new season, with new possibilities. That Saturday evening, a sun-drenched Villa Park played host to our hopes and dreams for the ten months to come. Rafa Benitez was beginning to mould the team in his fashion. He had already won a Champions League and FA Cup, and narrowly missed out on Champions League number two, against Milan. Many of us were confident that Rafa could be the man to bring the Premier League title to Anfield. He had also signed a youngster from Atletico, named Fernando Torres. El Nino would make his debut at Villa Park. An own-goal by Villa defender, Laursen, on the half-hour mark, gave Liverpool the lead at the break. The second-half was a tense affair but Villa were gifted a penalty for a handball by Carragher in the 86th minute. Villa’s Mr Dependable, Gareth Barry, put it away. So, 1-1 it was, as we entered the last few minutes. Then Liverpool were awarded a free-kick. 87th minute, Gerrard steps up. He couldn’t, could he? Of course, he could. Stunning strike, right in the top corner. Liverpool didn’t go on to win the league, but Stevie gave us hope. That’s what Gerrard did, he always kept that candle burning. The following season and Liverpool were in the thick of a title race with United. By now, Rafa had the Reds working like a well-oiled machine. Fulham, however, stuck it up to the Reds. Schwarzer, Hangeland and co could not be broken down. Liverpool were patient and stuck to their task but Fulham displayed stubbornness which was almost a match to our composure on the day. The goal itself came from what looked like an impossible situation. The Reds had pushed everyone up to Fulham’s defensive third, as the home side had everyone back. The tension on the pitch had transferred to the stands and Craven Cottage was ready to burst. Through the bodies, the ball found its way to Yossi Benayoun. Our unflappable Israeli had a quick look, saw exactly where the ball needed to go, and sent it on its way. United went on the win the league in May. But Rafa’s Reds made them sweat. It’s still hard to accept that Liverpool didn’t win the title, despite only two league defeats that term. Back to Craven Cottage for this one. But it’s from the recent season of Rodgers’ flying Reds. Liverpool couldn’t defend but they definitely knew how to score. Suarez, Sturridge and Sterling were on fire. At times they were unplayable. It was a rollercoaster ride. Rodgers takes a lot of stick. He may be a cheese-ball, but he gave us that journey along with Suarez and co, so let’s never forget that. Fulham again made it tough that Wednesday night. Twice the Londoners were ahead, firstly through an own-goal that only Kolo could score, and again through Kieran Richardson after Sturridge’s first-half equaliser. Coutinho then cancelled out Richardson’s strike and it was 2-2 as the game entered the closing stages. Sascha Riether fouled Sturridge inside the box in the 90th minute. Phil Dowd pointed to the spot. Gerrard was able to keep his head, putting it in the corner. Stockdale, who had replaced Stekelenburg 15 minutes earlier, went the right way but couldn’t stop it. One of my favourite Liverpool pictures (below) was taken during those celebrations. I smile when I think of this game. I don’t mean it, nor am I aware of it, it just happens. We all remember it. It would be remiss of me to compare it to Olympiakos in ‘05, or St Etienne in ‘77, but Dortmund in 2016 was fantastic. It was the first step into the spotlight from a Liverpool without Gerrard. The draw pitted Klopp against his old darlings from the Bundesliga. Only the football gods can write scripts like that. If you need your memory refreshed, the score was 1-1 since the away leg. Our German visitors came out of the blocks flying and were two up at Anfield after nine minutes, and that’s how it was at half-time. Origi pulled one back straight after the break but Reus went straight up the other end and made it 1-3. Coutinho made it 2-3 after sixty-six minutes, and Sakho made it 3-3 twelve minutes later! From here I’ll let you read the end of my piece, wrote the morning after, high on emotion…..
Anfield’s been rocking all night, but now it’s f*cking convulsing. A building with a rapid heartbeat. We’re in injury-time now. Dortmund are jittery. I always marvel at how football is such a complete game of confidence. An hour ago they looked unplayable, let alone unbeatable. Now it’s the mighty Reds who can’t be stopped. Free-kick on the right. Sturridge makes a smart run out wide to give an option for the pass. That’s what Danny is all about, that smart movement. His footwork lets him down momentarily and it looks like he’s lost it. But no, he plays a brilliant ball through the gap to Milner. Here he is. The man who infuriates us all with his corners, but his open-play crosses have been good. James Milner lays up the best hanging-ball-to-the-far-post-from-the-byline that you will ever see. I mean this was majestic and grandiose. The best cross you will see from that situation. We’ve got men lining up for it. It’s Lovren, it’s f*cking Lovren. Get the f*ck in and f*ck anything else. Get in, get in, get in!!!! Get in and stay in. Anfield enjoyed that. It took one deep breath and exhaled. It exhaled in a roar. When words just can’t express your delight, when literature can’t keep up with emotion and will not do it justice. That’s when we roar and scream. That’s what we did. You probably did it at Anfield, I did it in my sitting-room. My friends did it in the pub. We all did it. It was the perfect moment. Only football can give you those moments. This was my number one pick. Arsenal should have had this game dead and buried. Ljungberg scored in the 72nd minute, but it was down to poor finishing, and excellent performances from Henchoz and Hyypia, that they had not scored well before that. This Gunners team had Seaman, Dixon, Adams, Cole, Ljungberg, Vieira, Pires and Henry. Wenger had already tasted success with Arsenal and was only a few years away from creating the “Invincibles”. Liverpool were drawn as the “away” team for this final in Cardiff (Wembley was being renovated), and as a result had to wear the yellow and black second-strip. As often happens in football, Liverpool started to play a bit only after going behind. Ten minutes after Ljungberg’s opener, Liverpool snatched an equaliser through Michael Owen. That was the 83rd minute. Five minutes later, Liverpool fought to get the ball back on the edge of their own box, and what followed was the most route-one, counter-attacking goal you are ever likely to see. What a ball from Patrik Berger, though. The pace from Owen was incredible, leaving Dixon in his wake; that’s what Owen was all about. 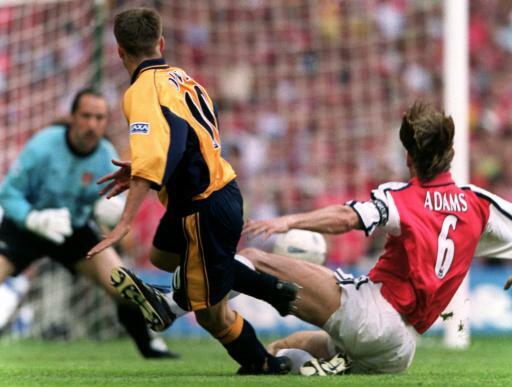 Adams tried his best to get across and block the shot but Owen was too quick. His finish was right in the corner, out of David Seaman’s reach. Brilliant. To see that end of the Millennium Stadium erupt after the goal will always be one of my fondest memories. He hasn’t endeared himself to us much since leaving in 2004, but we’ll always have Cardiff, Michael. Categories: Liverpool FC Opinion.' 'Tags: Arsenal, Aston Villa, Aubameyang, Borussia Dortmund, Brendan Rodgers, Coutinho, david seaman, Featured, freddie ljungberg, Fulham, Gerrard, henchoz, Houllier, hyypia, kieran richardson, Klopp, Kolo Toure, lee dixon, Liverpool, Lovren, Marco Reus, Michael Owen, Mkhitaryan, Origi, Rafa, Sakho, Sturridge, tony adams, Torres and yossi benayoun.